Paul, aka “RaidZero” is a good friend and we are always on top of his work. Lately, he has been dabbling into the dark arts of Android theme making, and so far, we are loving it. 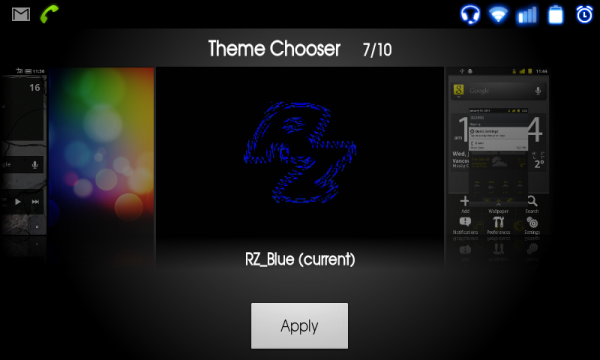 His first creation for the masses is entitled RZ Blue NRG, and it is a serious contender against all the other themes out there. With hints of honeycomb, and some insanely cool glowing icons and menus, it is the theme to carry you into the next year. If you are on CM7, or have a ROM which allows for the Theme Manager, check this out. We don’t even have to go into much detail when trying to explain the theme. Just check out the gallery, and if you like the glowing as much as we do, then give it a go. Modestly priced in the Android Market for only $0.99. In addition to this theme, might we also suggest Tha Shock by KovDev for the icons which go together like peas and carrots. Note: For those that ask about the clock widget, it is Beautiful Widgets which is an Android classic. And if you are looking for a good wallpaper: check these out. So tell us, what themes are you all using these days?